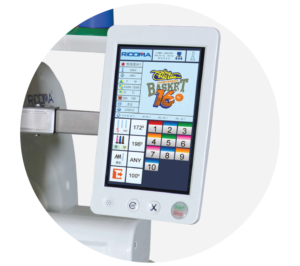 The RiCOMA EM-1010 10-needle embroidery machine has all the features to meet your embroidery needs. What is Hatch? INCLUDED FREE! 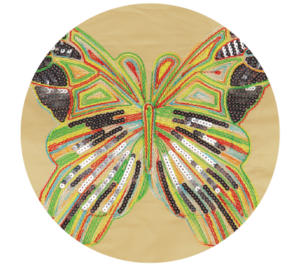 A Powerful embroidery software that doesn’t overwhelm you! Get started with Embroidery Basics. Manage, customize and output designs quickly and easily! An essential for all embroidery enthusiasts, Hatch Embroidery Basics gives you well-rounded functionality so you can get a head start on your designs. 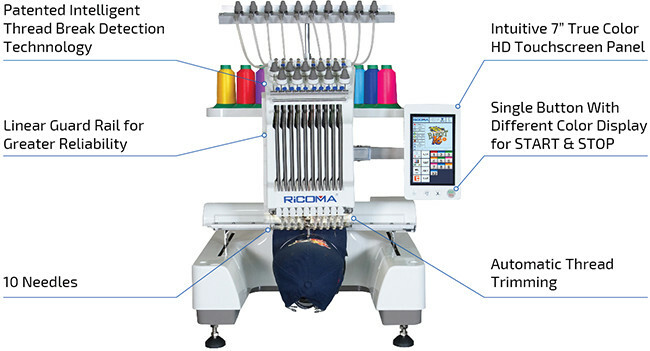 It is the ideal package for managing, customizing and printing embroidery designs easily – perfect for all hobbyists. 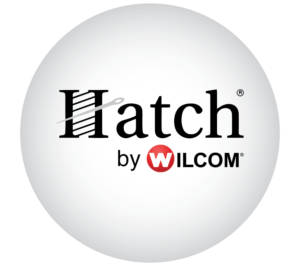 Get started with Hatch Embroidery Basics and experience the versatility and ease of use with the Hatch starter software. 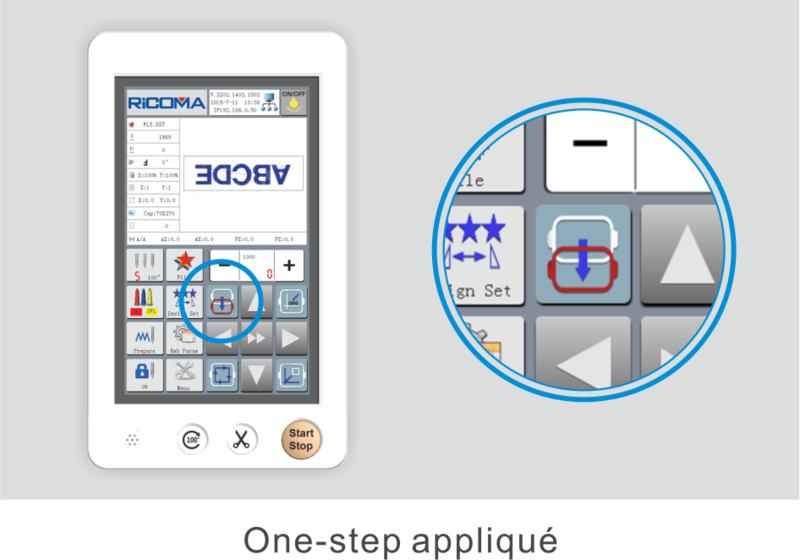 Hatch Embroidery basics takes an integrated approach to managing designs, giving you complete control over where your files are and how you maintain them. 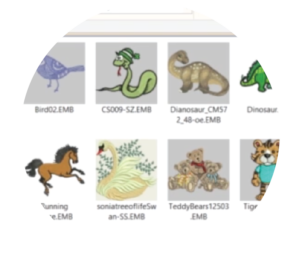 Use the built-in “Embroidery Library” to organize your embroidery designs for easy searching and browsing – no need to search your entire drive. Work without limitations… Convert your outline or stitch files with the click of a button so you have maximum accessibility. 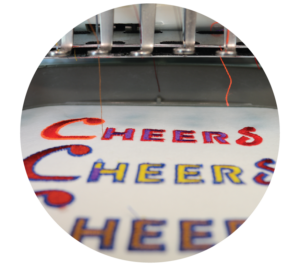 Use the files straight from your embroidery library and save them to and from the .EMB format. 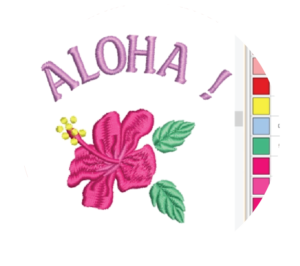 Hatch Embroidery Basics supports multiple formats including PCS, PES, VIP, JEF, SEW, DST, EXP and many more to ensure that you get the most out of existing designs. 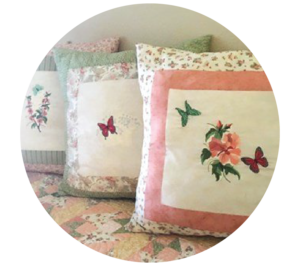 Keep track of all your file folders and locations within your “Embroidery Library”. Personalize your projects with the built-in templates and fonts. Monogrammer gives you the power to create unique monogram and lettering designs. 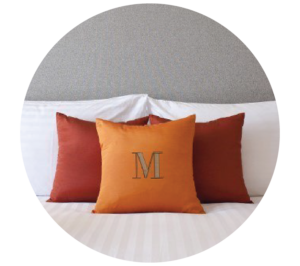 Take personalization into your own hands by creating and customizing your own lettering and monogramming with Hatch Monogrammer. Choose from a selection of pre-designed templates and then customize further by altering the color, stitch type, baselines, layouts and much more. Alternatively, use your personal designs and modify them to your own liking with Hatch Monogrammer. Quick, simple and creative professional standard lettering is now at your fingertips! Lettering doesn’t need to be basic! Do it your way with Hatch Monogrammer. 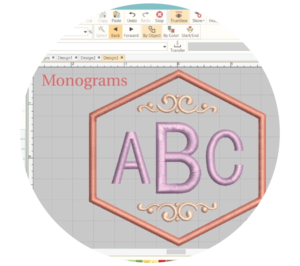 Using a built-in “Embroidery Library”, Monogrammer makes it simple to add custom lettering to your designs. Select from the 60 included fonts or convert your own TrueType or OpenType fonts. Adjust your lettering width to make it bolder, or slant them to give an italicized look. 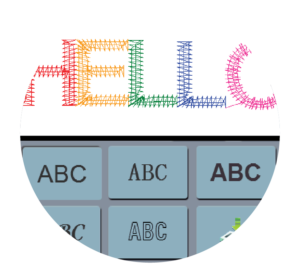 Spread your letters apart with the spacing tool. Edit your lettering using the “Select and Re-Shape Object” tool. Manipulate your lettering in multiple ways right on screen including: adjusting spacing, scaling lettering, and reshaping your letters to create your own personalized design. Go one step further and choose your layouts with multiple baselines. Lettering shapes and layouts are what give your lettering unique shapes and structures. Choose from a variety of placements – Free or fixed, circle or arched, upright and even free form are just the start of baselines you’ll find yourself using. Customize your lettering further by adding ‘lettering art’ styles which will distort your lettering by making it arch, compress, stretch or bulge- giving you the ability to manipulate your designs to your liking. Lettering doesn’t stop at one line. 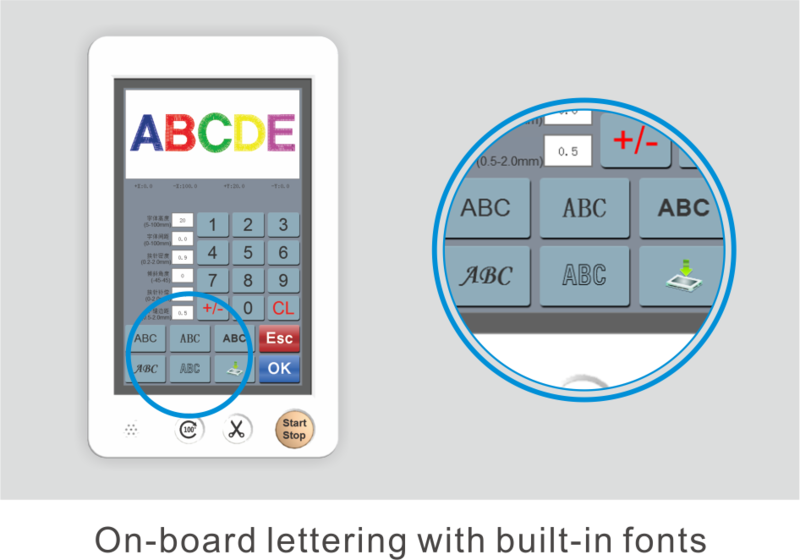 When dealing with multi-line lettering, Hatch Monogrammer provides up to four alignment and layout options. 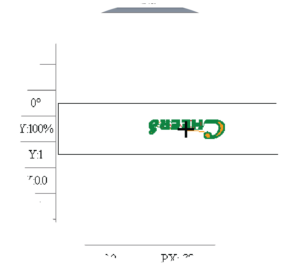 You can even customize each line accordingly to achieve the personalized alignments and baselines you envision! Starter kit complete with: thread, bobbins, backing etc. The EM-1010 is a 10 needle machine designed for the home embroidery enthusiasts, hobbyists, and crafter’s. 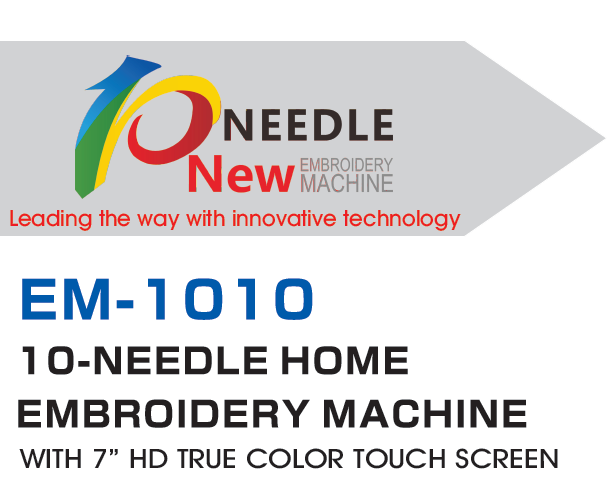 With a 7” intuitive user friendly LCD touchscreen interface it is truly redefining what a home embroidery machine can be. 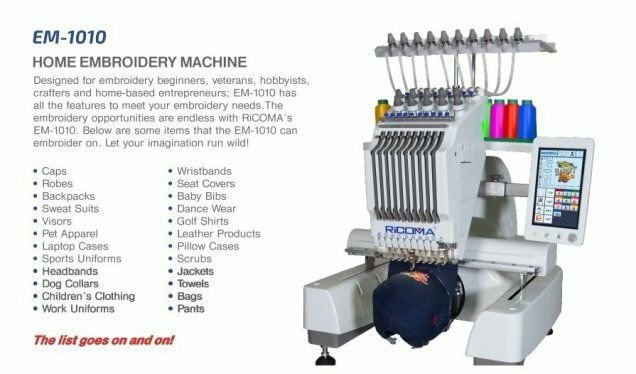 Lightweight and durable the EM-1010 comes complete with everything you have been longing for in a home embroidery machine. 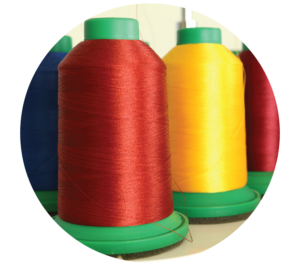 The copiously loaded RiCOMA is the choice of embroidery enthusiasts because of its affordability and user friendly design. 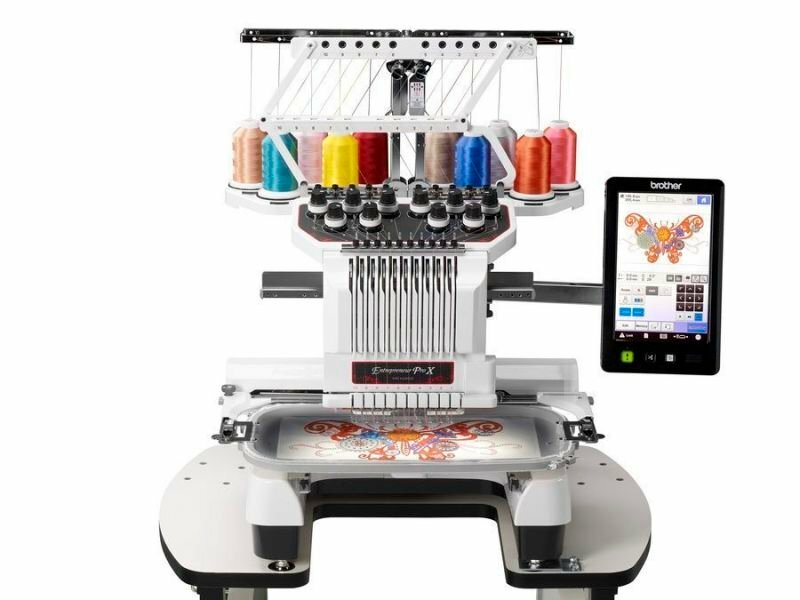 The machine itself allows you to simply upload (either via USB or LAN) a digital image and within a few touches of its intuitive touch screen you are ready to start your next creation. 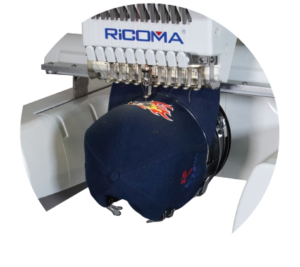 Easy to use and fun to operate make RiCOMA your choice for all your home embroidery projects. The Em-1010 is completely portable and lightweight. At under 45 kiloe. 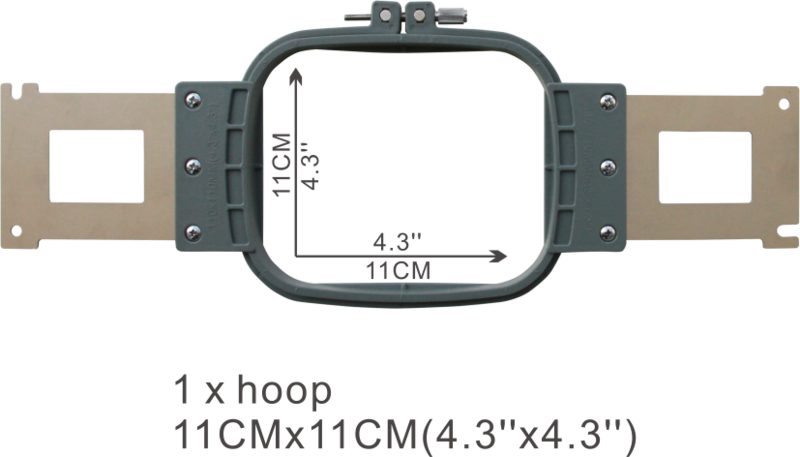 and 22.5″ x 22.5″ you can take your Em-1010 everywhere. 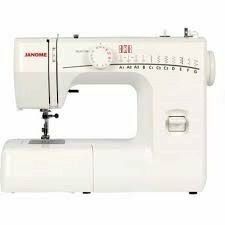 Great for church functions, embroidery parties. Beautiful designs are finished in a fraction of the time. 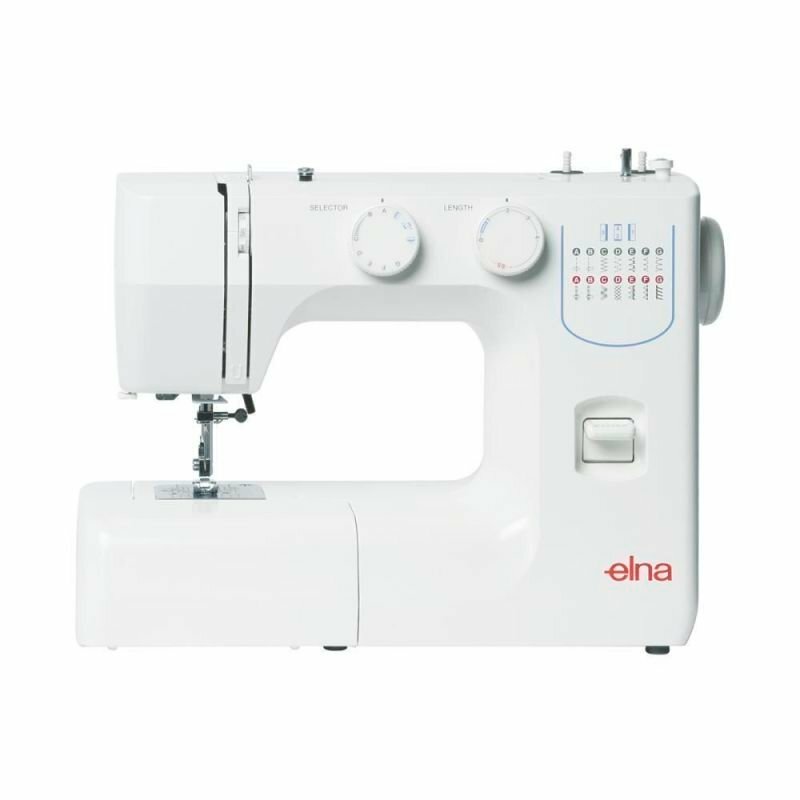 With the EM-1010 even the most complex designs are finished in a instant, with no need to change thread spools and operating at 1,000 stitches per a minute the Em-1010 will ignite your inner creativeness and will inspire you to a new level of efficiency. 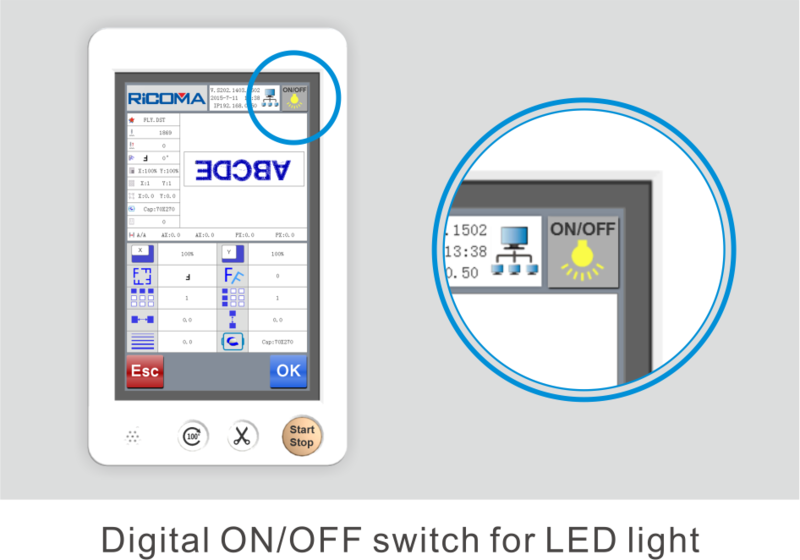 With our easy to use intuitive high definition touch screen viewing your projects and operating your machines will become an extension of yourself. 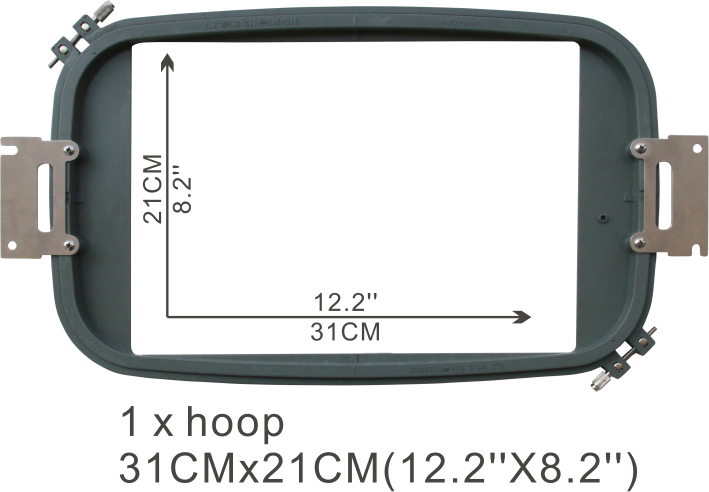 You’ll enjoy viewing, resizing, or editing your designs on the 7” in LCD screen with its enhanced 160 degree viewing angle there is no need to get up to see how your design is progressing. 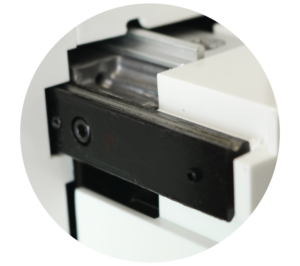 To further make viewing easier we have added a simplified rotating control arm to enable the screen to rotate a full 45 degrees horizontally and 25 degrees vertically to ensure a perfect view from any direction. 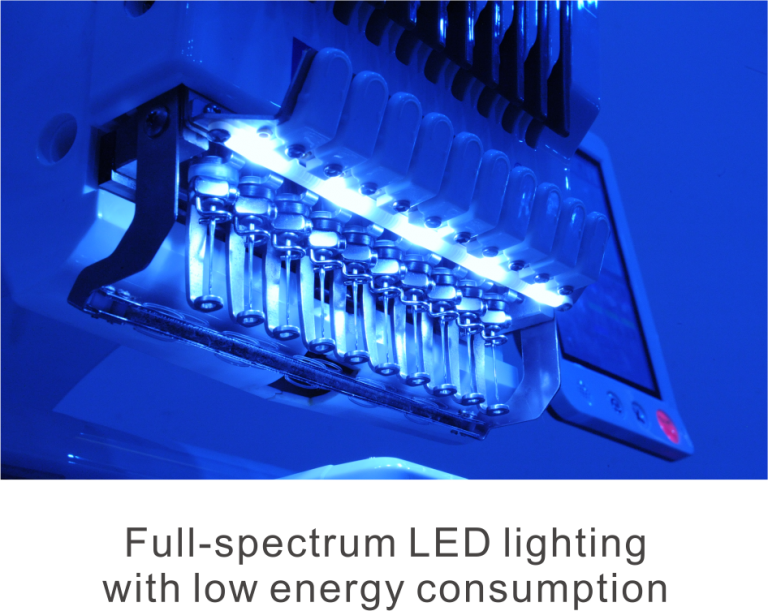 With our new LCD not only do we achieve a better viewing angle we also have reduced energy consumption by nearly 20%. 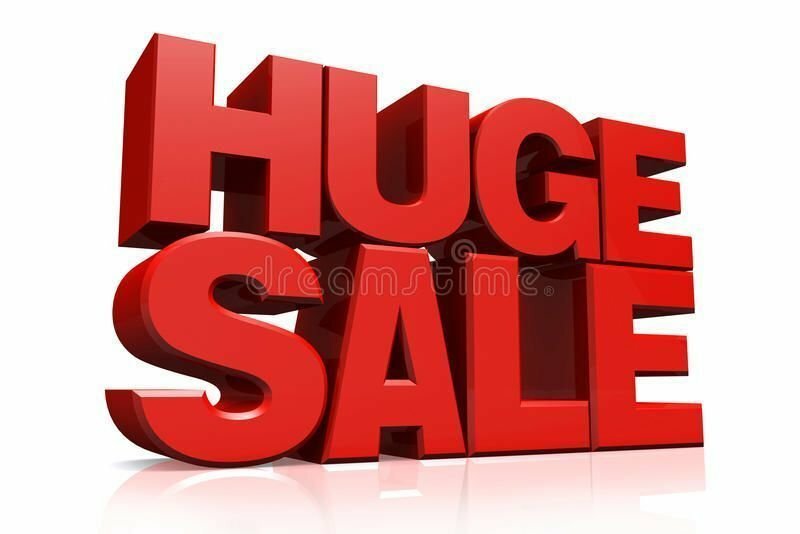 10 Built in Fonts and Hundreds More Included! When you embroider on caps the image actually needs to be flipped. 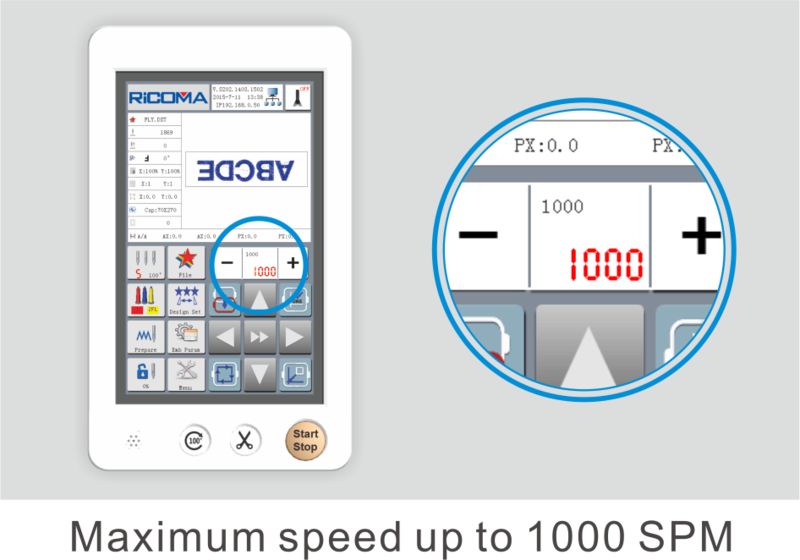 The Em-1010’s intelligent processor knows when you have a cap attached to the machine and automatically rotates the design 180°. 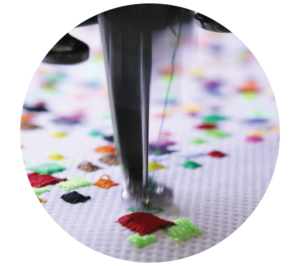 Another feature that makes producing professional embroidery a piece of cake. The Em-1010 comes equipped with an automatic color change system, ensuring your designs will run from beginning to end with out a need to monitor its progress. 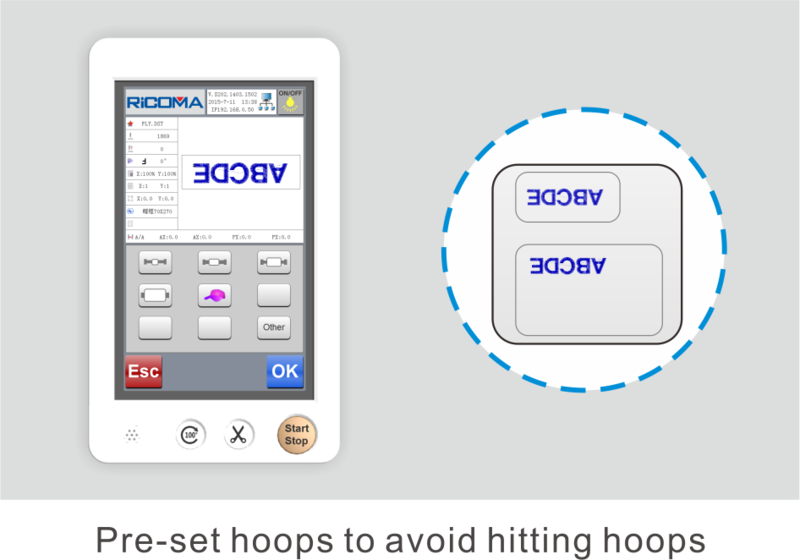 The Em-1010 makes embroidery easy, The Em-1010 has pre-set hoops that make it a cinch to select the correct hoop for the correct design. 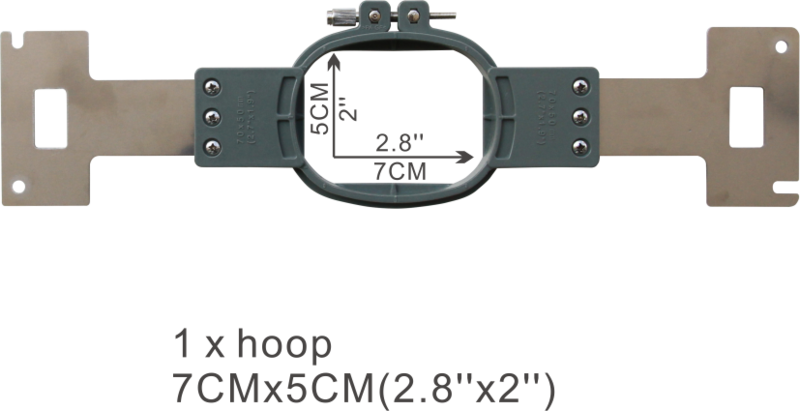 1 x hoop 2.8″ x 2.0″, 1 x hoop 4.3″ x 4.3″, 1 x hoop 7.5″ x 5.5″, 1 x hoop 12.2″ x 8.2″. Never miss a stitch! 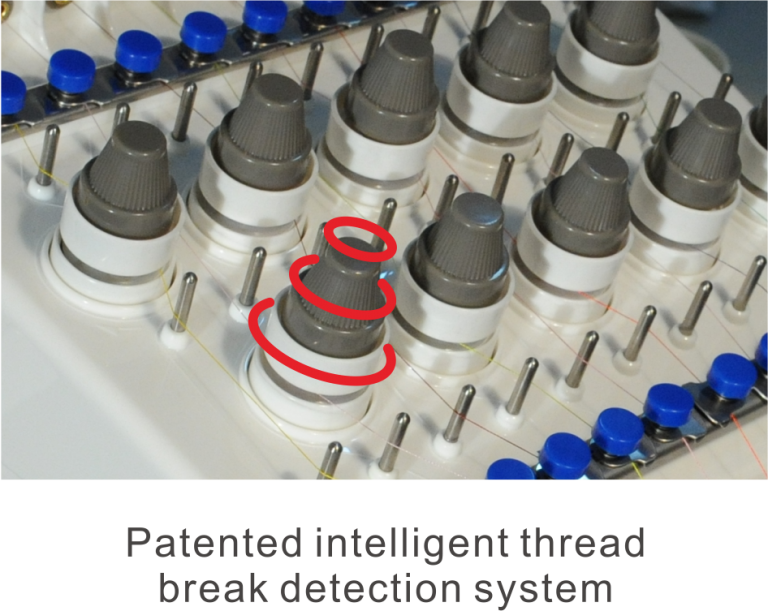 The Em-1010 comes with a forward thinking thread break detection system. 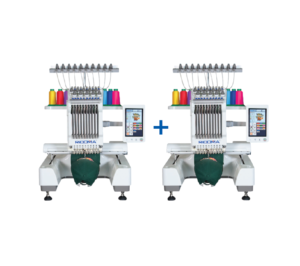 This system will not only assist in preventing thread breakage but will ensure the machine instantaneously pauses your design as to never miss a stitch again! 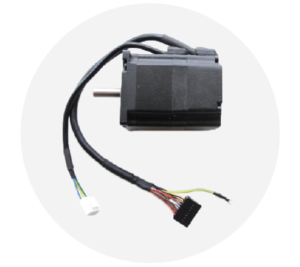 Servo motor enables the machine to be more durable and reliable. 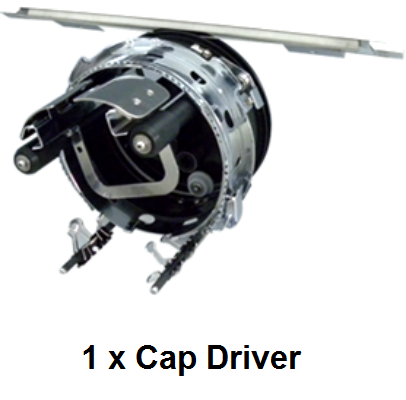 Servo motors improve machine performance and have a longer life, while having a lower energy utilization rate. Small Sewing Arm, Greater Versatility! 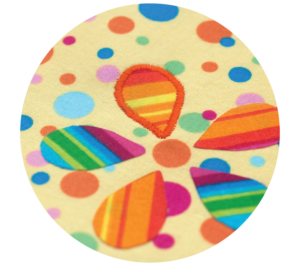 Embroider the smallest of items with the EM-1010. 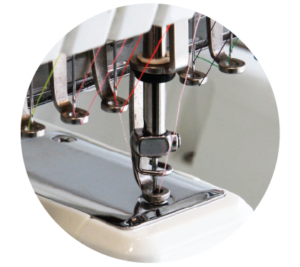 The Em-1010 has a 2″ sewing arm giving you the ability embroider on the smallest of items from: onesies to pockets. 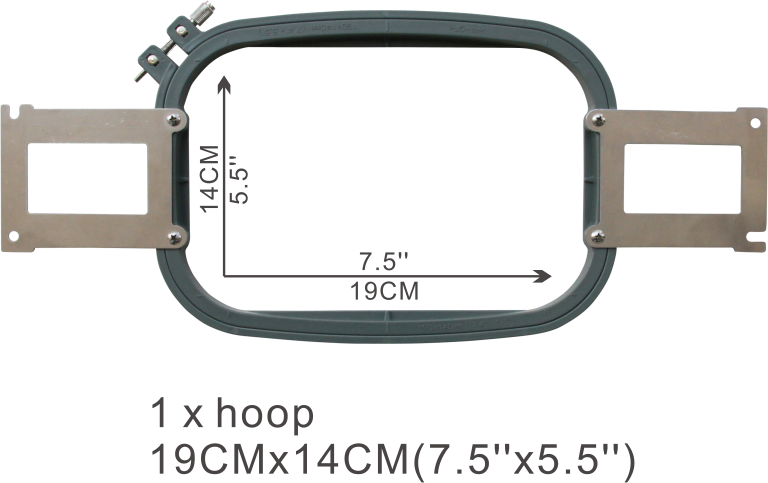 Take advantage of the versatility of one of the smallest sewing arms in the industry. 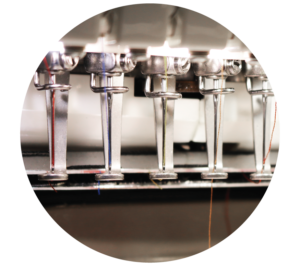 Linear guide rail makes the machine more reliable and ensures a smooth transition from different needles and colors; to ensure a smooth clean finished embroidery project. The EM-1010 will create beautifully finished projects every time. 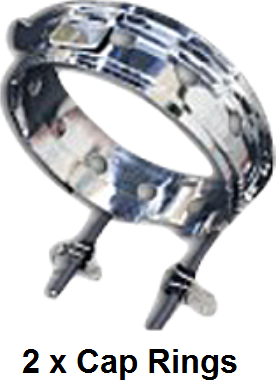 The automatic thread trimming will ensure a smooth finished design. Never worry about a power failure again. The EM-1010’s intelligent processors automatically back up your design in case of power failure or accidental power loss. 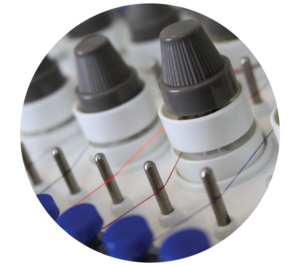 With our automatic data restoration feature when your machine is powered off and later powered back on you wont miss a stitch! With our automatic one step appliqué feature you’ll find Applique is now easier than ever. If one is good then two must be better! 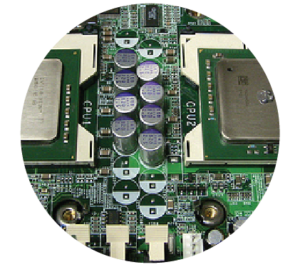 The EM-1010’s has Dual internal processors that enable design input/ output while machine is in operation. This is a time saving feature designed for those that are multitasking. Utilizing your EM-1010’s built in ethernet to computer capabilities makes it easy for design management on PC or linking multiple machines together; and can be upgraded to operate with your PC wirelessly. The Em-1010 Comes Complete with 14 Languages Built In! The EM-1010 comes with 15 different languages including: English, Spanish, French, Dutch, Portuguese, German, Russian, Turkey, Vietnamese, Hebrew, Arabic, Italian, Czech, Polish, Chinese. 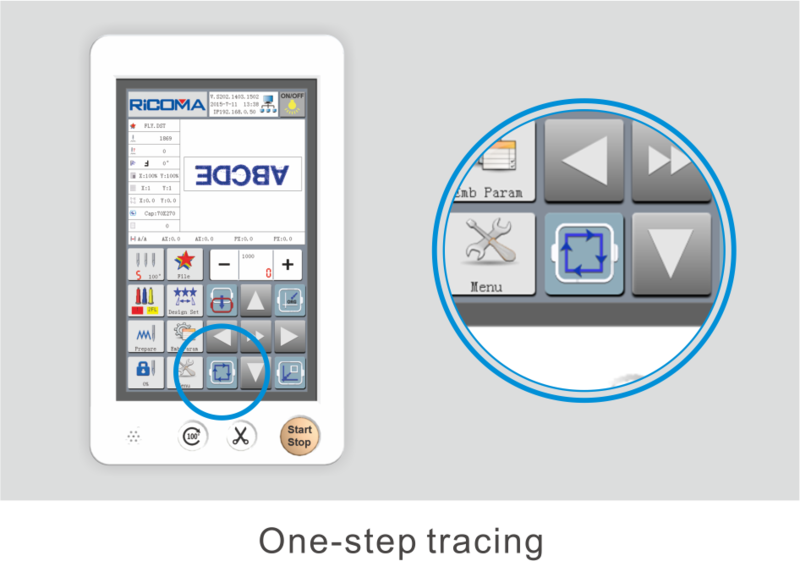 Utilizing the EM-1010’s one step tracing feature makes imaging your design a thing of the past, now you can visualize exactly where your design will be placed! Let Your Machine Run and Enjoy More Time With Your Family! The EM-1010 not only provides the user ease of use but with built in auditory and optical ques. No more will you be chained to your project or wondering if your machine is operating correctly. The EM-1010 has built in warnings and notifications to make you aware of any actions that may arise including: thread breakage, needle breakage, bobbin runout, and of course your completed design. The beauty of our functional engineering will ensure the EM-1010 will run smoothly years to come. 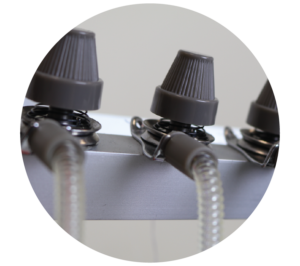 The EM-1010 utilizes a patented easy thread tension control system that comes factory calibrated and will ensure you years of minimum adjustment use. 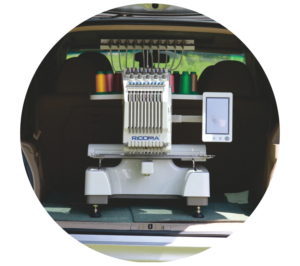 Providing you with all the flexibility to create the quality embroidery you have always dreamed of. One Machine Isn’t Enough, We Have Thought of Everything! 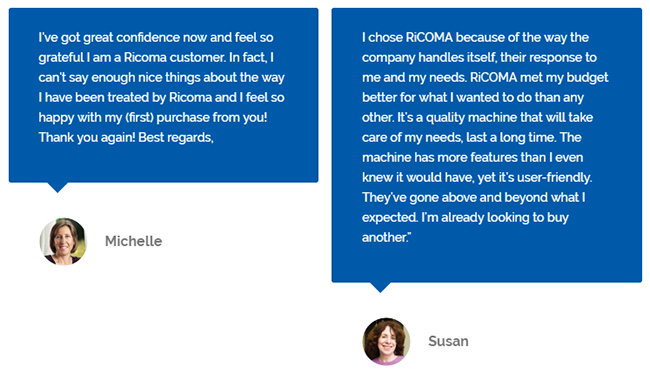 RiCOMA has thought of you and how Embroiders progress over time; so we made growing and expanding easy. 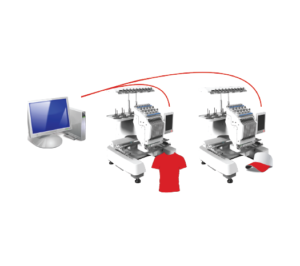 Use our easy link system to connect an unlimited amount of machines together. Whether its 2, 5 or 20 machines you’ll find that linking them together is a big time saver and easy. 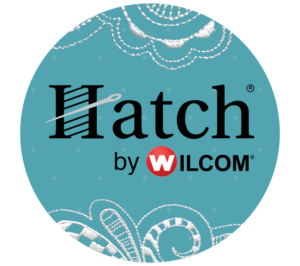 The Newest Machine Deserves The Newest Software; Hatch Embroidery Software by Wilcom! 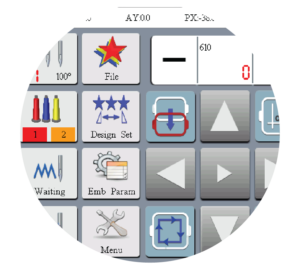 Hatch embroidery basics and Monogrammer, provide you with the essentials necessary to customize designs and create lettering and monogramming, presented in a user-friendly interface. Easy personalization starts with pre-designed templates and ends with professional quality lettering at your fingertips. Designs: We Give You give More So You Can Do More! 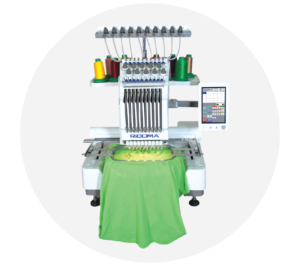 Included with every EM-1010 home embroidery machine we provide you with 20,000 quality embroidery designs. 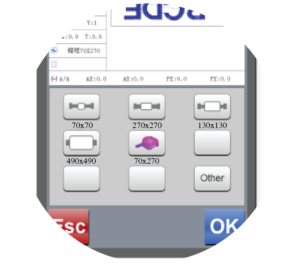 You can easily load up to 200 designs for easy access on your EM-1010 or utilize any of the 10 built in fonts to further customize these images. We make bringing your imagination and creativity to life, personalize them further by adjusting spacing or angle. Connect to the included software to reach an extended plethora of designs, fonts and monograming capabilities. Designed for embroidery beginners, veterans, hobbyists, crafters and home-based entrepreneurs, EM-1010 has all the features to meet your embroidery needs. 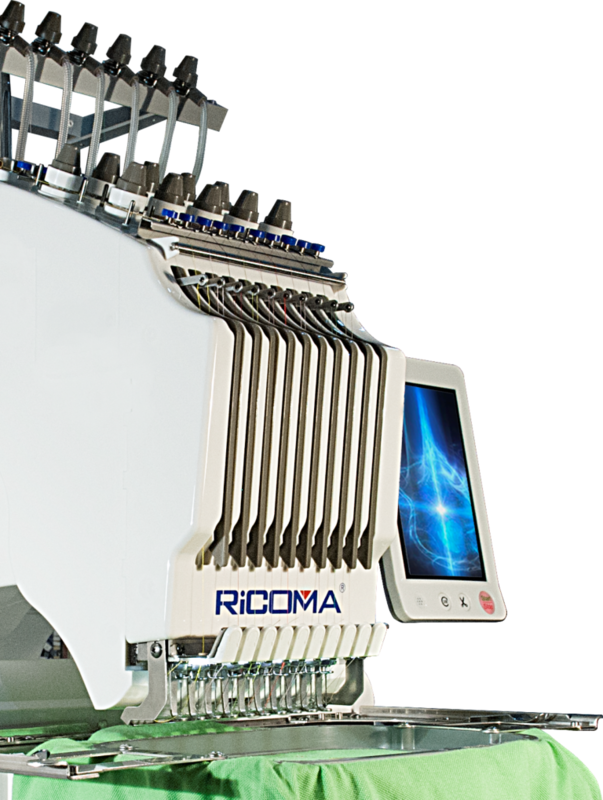 The embroidery opportunities are endless with RICOMA’s EM-1010. Let your imagination run wild. The sky is the limit! Below are some examples of items that the EM-1010 can embroider on. Multiple languages available including English, Spanish, Portuguese, Chinese, Turkish, Dutch, French, German, Thai, Arabic, etc. Maximum embroidery area 31x21cm or 12.2"x8.3"
We ship free to most cities in Australia. 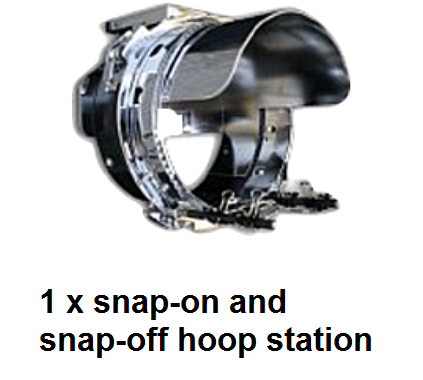 This item can only be shipping to a real address and not a Post Office Box.